The Holy Monastery of Trooditissa holds a special place among Cypriot monasteries, not only because of the exceptional natural beauty of its surroundings but also because of its remarkable antiquity, the wealth of its painted artefacts and the low-profile activities which still continues to evovle, despite the repeatedly difficult circumstances. 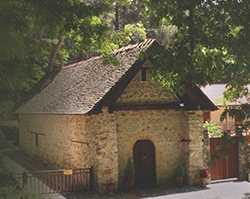 The Monastery is situated at 10.3 km (15 mins) from Troodos . 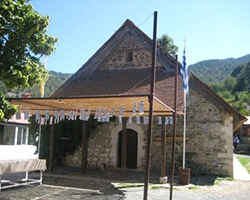 This monastery is in the Troodos Mountains, to the east of Prodromos. The monk Vasileios Barski, who visited the monastery in 1735, left a detailed and accurate description and a wonderful plan which give us valuable information about the history of the monastery since very little is known about it from other sources. Only the chapel of the old monastery has survived and it is here that the famous icon of Our Lady the Merciful Trikoukkiotissa, which can stop droughts, is kept. The monastery was abandoned for years but since 1997 it has been operating as a nunnery. The Monastery is 9.7 km (15 mins) from Troodos. According to Nikos Christos, the monastery was founded in the Byzantine Period, to be more precise the 12th century when other monasteries were founded in the area. This date, which Christos substantiates with the writings of Archimandrite Epiphanius, is also supported by the 12th century icon, the Life Giving Spring of Saittiotissas. 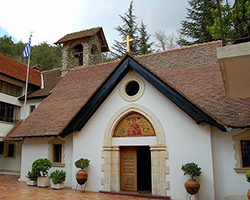 Around 1914, when the monastery was deconsecrated by Bishop Meletios Metaxakis, the icon was transferred to the church of the Holy Cross in the neighbouring village of Kouka. 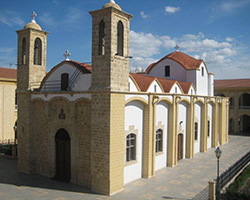 Later, in 2003, the image was transferred to the Bishopric of Limassol. At this point it should be mentioned that the monastery was converted into a hotel in 1914. The monastery is 18 km (23 mins) from Troodos. The Monastery of Our Lady of Kykkos, otherwise known as Kykkos Monastery, is one of the three largest and most historic monasteries in Cyprus. It is a men’s monastery and belongs to the Church of Cyprus. It is also one of the five Stauropegic Monasteries (subordinated directly to a Patriarch or Synod, rather than to a local Bishop) in the Church of Cyprus and the Abbot is the current Bishop of Kykkos . The monastery is home to the famous icon of Our Lady of Mercy (of Kykkos) showing the Virgin Mary holding the baby Jesus on the right side which, according to legend, is the work of the Apostle Luke. The monastery is 28.2 km (42 mins) from Troodos.